It’s Lesson#11 - Love is in the Air. It's been a while since I cranked up my Microphone and my Mac to produce a podcast. My house renovations are still going on, and we are still living with my in-laws. Even though my current environment is not ideal for writing and producing podcasts, I felt that I needed to get back out there for several reasons. I'm still getting lots of e-mails on a daily basis from listeners who express their desire for more of 'A Spoonful of Russian'. Another reason is we are working on getting things ready for our trip to my hometown in Russia this summer, and my daughters are in serious need of freshenning up their Russian:) There are other reasons as well. But personally, I just miss it myself. I miss plotting the idea of the lesson, typing it on my PowerBook (while listening to some nice classical music. Russian, of course), recording it, choosing different audio transitions, piecing it all together in GarageBand, uploading it, and getting your responses later. LESSON - "Love is in the Air"
- "I love You" , of course. "Я Тебя Люблю." For your convenience I created some flash-cards to go with the lesson. 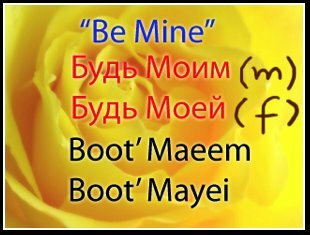 - Another phrase you can put down in your valentine is: "Be Mine". And depending on the gender the Russian translation is either "Будь Моим" or "Будь Моей". 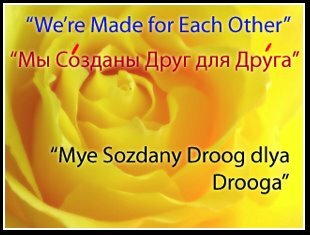 - "We're Made for each Other" - "Мы Созданы Друг для Друга". - If you are an older couple I have a perfect card for you on Apple site. It's one of the iCards Apple offers. 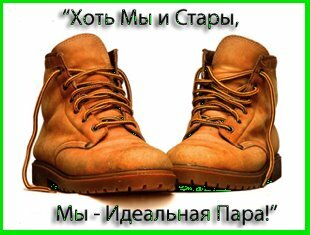 It uses one of my photos that depicts a pair of old boots. It says: "We May be Old, but we Match!" In Russian, "Хоть Мы и Стары, Мы - Идеальная Пара!" You can locate my card on mac.com --> iCards --> under "new in iCards". Now that you have a few phrases in Russian to dazzle your sweetheart, you might want to play this next song for her/ or him. 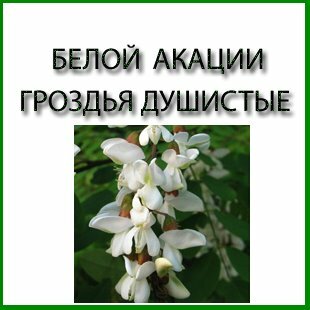 It's called БЕЛОЙ АКАЦИИ ГРОЗДЬЯ ДУШИСТЫЕ. Literally "Sweet-smelling clusters of acacia". It's a romantic song about 2 lovers reminiscing about their time together one summer. The unforgettable time they spent under an acacia tree, listening to the nightingale's song and whispering the words "I am yours forever". Годы промчались, седыми нас делая. A gde shytka perbogo aprelja? Dostatochna interesniy podkast. Asobena dlja myziki slyshaju inagda. Ja ychiusj rycki jazik i ne govoriu dostotochno xorosho (i moja transliteracija kak vidna nekokaja), no vce ravno, etot podkast pomagaet. Tozhe pomagaet russianpodcasting, http://www.russianpodcasting.ru/ - tam mnoga ryckix podkastov. Mozhno poprobivatj i drygim (no nyzhno jam imetj pa rycki xotj by nemnogo). Esli bi yexal pa chastnee bylo by esche choroshii vash podkast. Vcio ravno, ydache c etom. If I had a newer ipod i would love the enhanced version, but unfortunately I have the old one, with pics only so I'll have to stick to the mp3... but great job though!! Keep up the great work!! I'm a huge fan!! I liked the mp4 format. I only just discovered 'A Spoonful of Russian' but I can already tell I am going to be a fan of yours. I am using your show as a way to get back to speaking some Russian again. Well, well.. First of.. I was looking for podcasts to start learning basic words in russian. I've met a russian female friend online and I would like to start using simple words. Your blog is amazing so far. I have to say that I was quite shocked when I read your Katrina adventures. My goodness. That was a direct report from a local. I never really looked at that before. (I'm from Montreal, Canada) All I saw was news coverage. Reading your adventures was quite something. So, I'm downloading your podcasts now, I'm curious to learn. What I want to learn also is the 'english' written version of the words, like that it will be easier for me to pronounce and type online. One new avid reader.. Possibly, if something more or a friendship comes out of it. I have two Russian friends here in America who are planning a trip to Russia in the Summer of 07. I can hardly wait!! I'm trying to learn Russian so I can communicate when I get there. . .and I'd love to surprise them by jumping into a Russian conversation. I've signed up for a Russian language course and then I found your podcast. THANK YOU! I can now hear correct pronunciations anytime I need to! Great job! I recently found your site and enjoy it very much. Keep up the good work. Hi! I've just enjoyed the heck out of the Russian lessons. I have a new Russian friend, and need a refresher course. It's been about 5 years since I lived in Ukraine, and I'm rusty. You have a pleasant voice and on-air personality. I've downloaded everything. Hi Natalia -- Just wanted to say thanks for a great site. I'll be travelling to St. Petersburg in July - my third visit to Russia to spend time with a friend who I met on my first visit there. I've taken a short Russian course, but it covered so much so fast that I hardly remember any of it. I've just listened to a couple of your podcasts; they're a great refresher for me and some of the later lessons will add some new vocabulary for me. Most of all, though, just hearing the Russian has me very excited to go back there. Just two lines from Barcelona... I've been dreaming to learn some russian for the last 2 or so years, but I just don't have the time to go to a language school or to call a private teacher. I tried some cd-based courses but they are just boooooring. Yours is the first course I can practice with in the car, and have some fun AND learn russian, so thanks again and keep up with the good work! Guys, it's not the best idea to post grammar questions as 'Anonymous'. Please, e-mail me with all your questions. Thanks. I thought I would leave my first comment. I dont know what to say except that I have enjoyed reading. Many thanks for your support of this podcast! Natalia Worthington©2005 - 2015. Powered by Blogger.